Advisor to Governor, K Vijay Kumar Monday said that various initiatives are being taken for promoting sports activities among the youth in Jammu and Kashmir. Advisor Kumar was speaking as Chief Guest during the Youth Convention at SKICC which was organized by Divisional Commissioner Kashmir, Youth Services & Sports (YSS) and J&K State Sports Council (JKSSC). The convention was organized to felicitate those youth from Kashmir division including Leh and Kargil who have brought laurels for the State at local as well as at national and international levels in various fields. 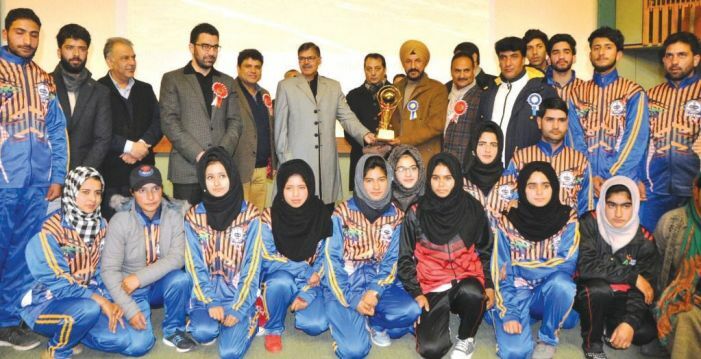 The convention was attended by the scores of boys and girls from various districts of Kashmir including Leh and Kargil, among which, various young sports personalities shared their stories with regards to success they have achieved in their respective sport. They also informed about various difficulties faced by them and also gave their suggestions with regards to the improvement in sports facilities in the State. Speaking on the Divisional Commissioner, Kashmir Baseer Ahmed Khan said that the aim of the convention is to take first-hand suggestions from the youth involved in sports activities so that the same can be executed on the ground. He said there is a lot of talent in Kashmir which needs to be harnessed and channelized so that desirable results could be achieved. He further said that the divisional administration has identified 580 places in Kashmir Division where the sports infrastructure is under developmental process so to provide better facilities for the youth. Speaking on the occasion, Secretary YSS, Sarmad Hafeez said that the department is working hard to find the talented sportspersons from various areas of the State so that they can be groomed into the better sports professionals. “We at YSS are trying hard to provide sports opportunity to our youth,” he said adding all the sportspersons, their coaches and the sports administration has to work with zeal and zest to bring the better results on ground level. He said that the various interactions with the youth will be organized by YSS regularly from time to time so that the department could better understand the needs and challenges faced by the youth involved in sports. Giving details about schemes and initiatives of YSS in the State, Hafeez said that Rs 10 lakh has been released to every block in the State under Khelo India scheme for various sports activities. He also informed that to give a flip to indoor sports the department is constructing Indoor Halls in every district of the State, at the cost of Rs 4 crore each. He said besides, various other sports-related infra works are also under process on large scale. The Secretary informed that the department is also working on some modalities so that in near future sports infrastructure would be developed in schools, colleges and other educational institutions in the State. The aim of doing all this is to promote the sports culture among the youth, said Hafeez. Secretary JKSSC, Dr Naseem Javeed Choudhary, Director General YSS, Dr Saleem-Ur-Rehman, Deputy Commissioner Srinagar, Dr Syed Abid Rashid Shah and officers representing various districts were also present on the occasion.